I am not sure where to begin... I'll start with two names: Jack Black & Eric Kripke. Now sprinkle in Eli Roth's debut into family entertainment and you have the oddest cocktail ever! When you set out to scare, Eric Kripke is your man! One, glorious title Supernatural. Ahhhh, the Winchesters. Now combine Jack Black AND Kate Blanchet, pure magic! I wasn't sure how in the world someone from the realm of Supernatural was going to hone it in for a "family" friendly scare but man did he deliver. 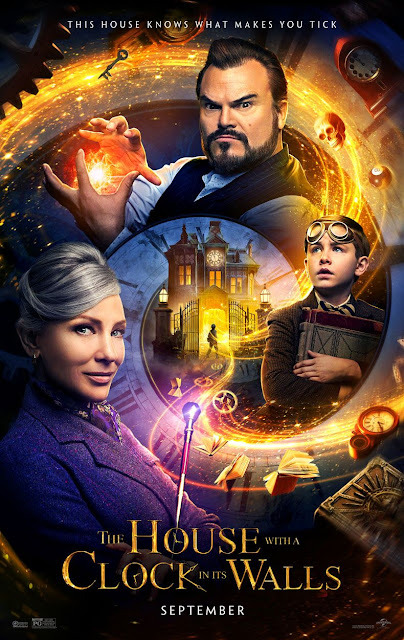 The House with a Clock in Its Walls was everything! Louis was weird and it was a celebration to watch. This movie was jam packed with themes: family loss, bullying, the underdog, persistence, believing in yourself and so on. I left loving the color purple, wanting a ginormous fireplace, feeling the need to burn all dolls and a little afraid of Jack-o-Lanterns. It was G-R-E-A-T.
✔︎ Middle schoolers: loved it. 𐄂 1st grader: had to sit in my seat and remind me he loved me and thought I "just needed a hug" right at that pumpkin filled moment. No crying. If your youngsters can't handle the Goosebumps flicks, you might want to wait until they are a bit older and desensitized.